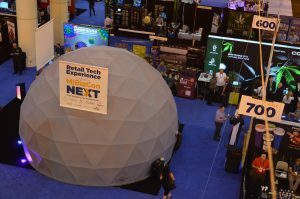 The mini IMAX-style dome for the Future of Retail campaign. Whether they heard the buzz from friends or were mostly looking for an excuse to sit down and rest their feet, attendees of MJBizConNEXT ducked inside a mysterious gray dome on the expo floor and found themselves feeling emotional about something unexpected: the future of cannabis retail. Viewers inside the mini IMAX-style dome were taken on a visual, auditory, inspirational journey about what’s possible for the cannabis market with responsible testing, accountability and transparency for retail. Nine leading companies, led by Baker and supported by MJBizDaily, came together to launch this new initiative, the Future of Cannabis Retail at MJBizConNEXT. The hope is to catalyze a movement and transform the industry into a highly collaborative cannabis ecosystem focused on creating an accountable, transparent future. MJBizDaily supports the Future of Cannabis Retail initiative because we believe that the best way to further the conversation of cannabis as an industry is to further develop and sustain the act of commerce which helps build the economy and overall quality of life of those regions and individuals which the industry serves. Learn more about ways we support the cannabis industry.